The ELCAN SpecterDR Dual Role 1x / 4x Optical Sight, 5.56 CX5395 Illuminated Ballistic Reticle, A.R.M.S. 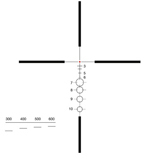 Picatinny Mount (DFOV14-C1) represents a revolution in optical sight design. The world’s first truly dual field of view optical sight, the SpecterDR switches instantly from a 4x magnified sight to a 1x CQB sight with the throw of a lever. Unlike zoom sights, the SpecterDR offers an optimized optical path and identical eye relief in both 4x and 1x modes. Depending upon the situation, the user may adjust the sight to illuminate the entire crosshair or just a brilliant red dot in the center. In 4x mode the SpecterDR offers a generous field of view, long eye relief, and Elcan’s legendary crystal clear image. In CQB mode, the SpecterDR has by far the largest field of view in the industry. The 4x and CQB Reticles are plainly visible even in the case of loss of electrical power due to battery failure or EMP. All Elcan scopes are tested at the factory prior to shipping. As a result, the mount may show use marks. These scopes are NEW despite some markings that may indicate otherwise. Scope Length: 6" x 2.9" x 3"